MemDB Quotation System helps you to create professional quotation easily. Traditionally, quotation is created by handwriting. Nowadays, many companies are using Excel or Word to create quotation. However, user needs to retype the items or copy and paste items from one quotation to another quotation. 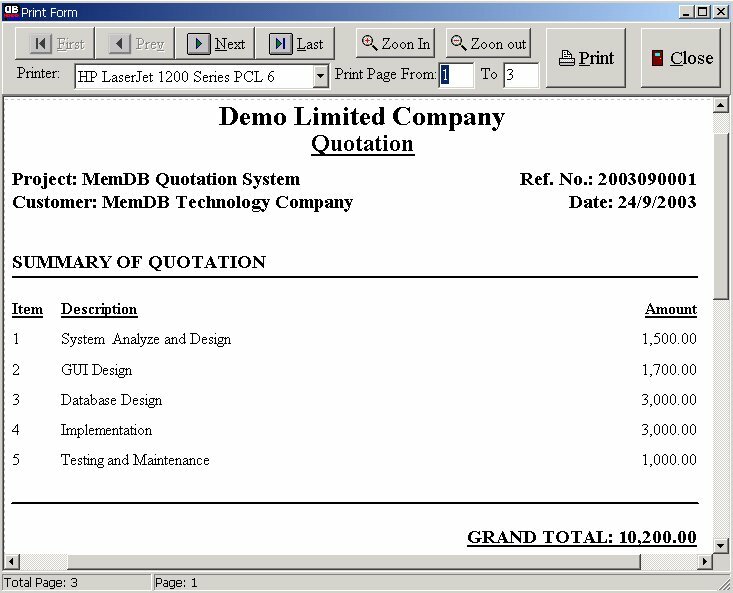 To increase the efficiency of this task, MemDB Technology Company designs an easy to use system to help user to create professional quotation easily. User can setup the items and customers. When creating a quotation, user can select the items and create a multilevel quotation easily (up to three levels). The system can print a SUMMARY OF QUOTATION (the first level). To see a sample, you can click the PDF file created by this system (http://memdb.com/MemQuotation/quotationE.pdf). The trial version is same as the registered version except the 30 days trial limit. After register, all data in the database can still be used and all "Demo Company Limited" title will change to your company name. The registered price is US $280. Please input your company name (the name to replace the "Demo Company Limited" in the program) and then press "Buy Now" button. After you have paid the charge, you will receive the password immediately through email. Install: Just simply execute setup.exe to install.